Not to be left out by Apple, Instagram recently introduced its own version of the iPhone 6s and iPhone 6s Plus’ Live Photos feature, called Boomerang. This app joins HTC’s Zoe feature along with other apps like Fyuse in providing a piece of multimedia that is similar to the Live Photos. And no, it’s not a GIF or a video – the app simply takes 10 photos and meshes them all together, creating a moving, video-like effect. It works differently compared to Live Photos: instead of recording 1.5 seconds before and after the still photo was taken, Boomerang takes a slew of 10 photos and turns it into a mini-video that loops backward and forward. It can utilize both the front and back cameras. It can be used for selfies and legitimate photos. You can immediately share these “moving photos” on Instagram or Facebook. There’s no need to sign up – you only have to download the app, give access to the camera and Photos app, and you’re good to go. These roughly last four seconds and can be viewed on your camera roll. Instagram announced Boomerang’s release on its official blog. It is available on the App Store for free and is compatible on devices (iPhone, iPod, iPad) running on iOS 7.0 and beyond. Boomerang is free and does not need an iPhone 6s to function: it runs smoothly, even on an iPhone 4s. 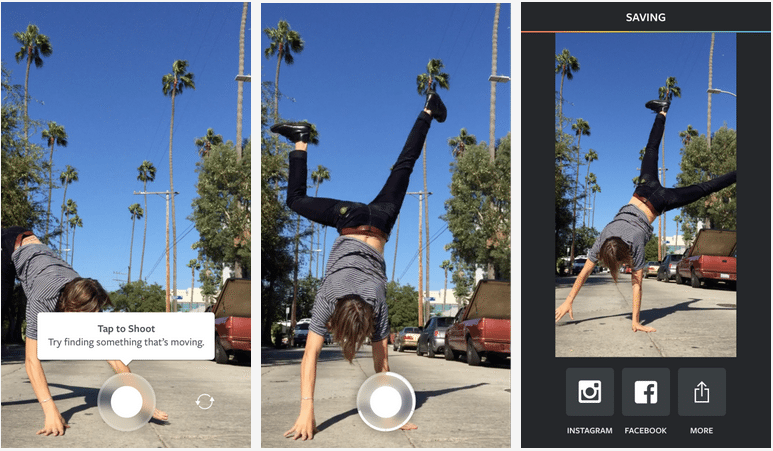 The app is perfect for capturing moments like your friend doing cartwheels, your cat jumping, or you and your best friend taking a wacky selfie. It’s not exactly like the iPhone 6s Live Photos feature, but it’s a welcome addition to users who want something like it on their earlier phone models. Live Photos is only available on the iPhone 6s, unless if you’ve found a way to hack into your iPhone 6.